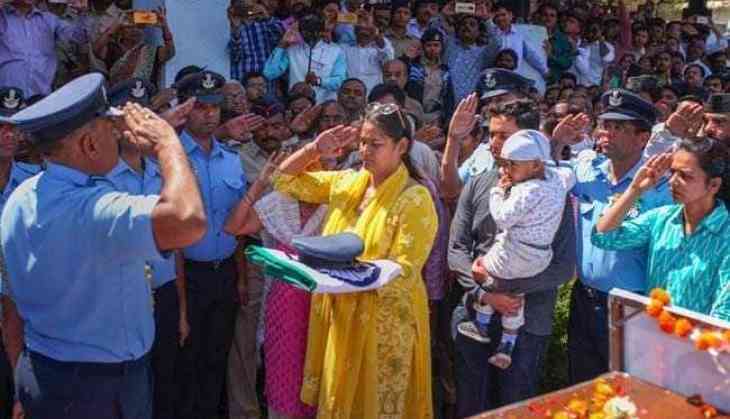 Vijeta Mandavgane, wife of an Air Force pilot who was killed in a Mi-17 chopper crashed in Jammu and Kashmir's Budgam has sent out a strong message to those who are using social media to vent their anger and shed tears over the India-Pakistan tension. Vijeta Mandavgane's husband, Squadron Leader Ninad Mandavgane, among the seven killed in the pilot crash. IAF pilot was cremated with full military honours in Maharashtra's Nashik on Friday. In a strong message to social media users who are showcasing anger on India-Pakistan, Vijeta urged netizens to show restraint and not whip up sentiments. "There is a lot happening on social media and on TV. Media acts responsibly and sometimes don't. You shout slogans. Instead of that, if you truly want to bring about change, for my Ninad, for WC Abhinandan and the martyrs, do a small thing. Either join the forces or make your family members join the forces. If you can't, then at least bring about small changes around you to help the nation. You can keep your surroundings clean, not litter the roads, not urinate in the public, not harassing girls," Ms Mandavgane told reporters. The message was widely shared online. Squadron Leader Ninad Mandavgane was killed after a Russian made Mi-17 crashed in an open field near Garend Kalaan village in Budgam in Jammu and Kashmir on Wednesday. A civilian was killed too. Yuvraj Singh's 'bhabhi' and Ace Of Space contestant, Akanksha Sharma opens up about her struggles post divorce and her love affair! READ NEXT >> Yuvraj Singh's 'bhabhi' and Ace Of Space contestant, Akanksha Sharma opens up about her struggles post divorce and her love affair!